Hugo Boss has launched Boss Bottled Infinite, a new fragrance for men. Boss Bottled Infinite is a flanker to 1998's Boss Bottled (and not to be confused with 2013's Boss Bottled Unlimited). The notes include mandarin, apple, cinnamon, sage, patchouli, rosemary, lavender, olivewood and sandalwood. 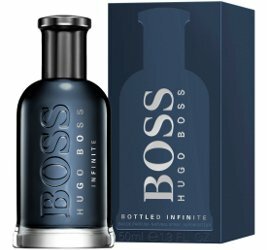 Boss Bottled Infinite by Hugo Boss is available in 50, 100 and 200 ml Eau de Parfum. All things considered, the tag “word salad” is making me happy to a truly unlikely degree. Thank you for that, Robin. Ha, it is shocking how happy it makes me too — when I remember to use it!